Charles H. Senff, New York, 1928.
with F. Kleinberger, New York. Oscar B. Cintas; his sale, Parke-Bernet, New York, May 1, 1963, lot 12 as Rembrandt and signed and dated '1651' ($260,000). Jack and Belle Linsky, New York. C. Hofstede de Groot, A Catalogue Raisonné, etc., VI, 1916, p. 254, no. 504 as Rembrandt. W.R. Valentiner, Rembrandt, Wiedergefunde Gemälde, Klassiker der Kunst, 1921, no. 66, pl. 63 as Rembrandt. W.R. Valentiner, Rembrandt Paintings in America, 1932, no. 111 as Rembrandt. A. Bredius, The Paintings of Rembrandt, 1936, no. 379 as Rembrandt. W. Pach, Catalogue of European and American Paintings, Masterpieces of Art, 1940, p. 64, no. 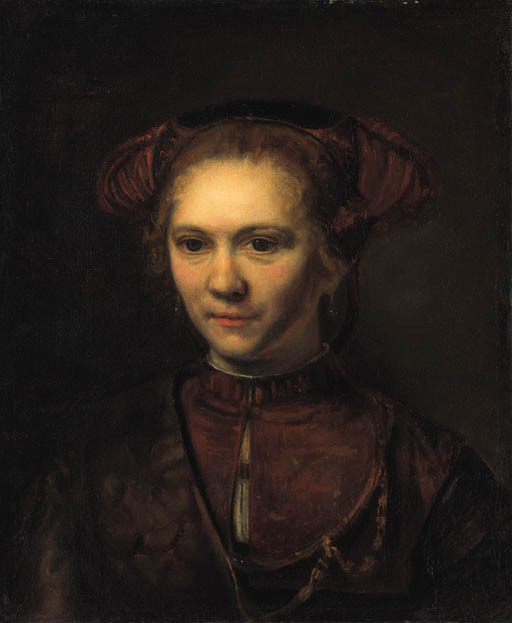 88 as Rembrandt. J. Rosenberg, Rembrandt, 1948, p. 245 as Rembrandt. Detroit, Detroit Institute of Arts, Loan Exhibition of Paintings by Rembrandt, 1930, no. 50. New York, Masterpieces of Art, 1940, no. 88. In a letter dated Aug. 3, 1997 (private communication), Professor Werner Sumowski states that he finds the attribution of the present painting to Willem Drost 'convincing' by comparison with nos. 328 and 2040 in vols. I and V of his Gemälde der Rembrandt-Schüler (op. cit., 1983, I, p. 615, no. 328, illus. p. 637, fig. 328; and V, p. 3090, no. 2040, illus. p. 3171, fig. 2040). He further states that a copy (private collection, Sweden) shows the same figure of a woman, half length, holding a flower.